Beyond Ramen: Happy Pi Day! Brave Sir Robin reminded me that today is Pi Day! I hope you're able to celebrate with some pie, whether at 1:59pm (or, if you want to be precise, 1:59 am) or any other time of day. How did you do that clever thing? We LOVE pumpkin pie in this house. Why is it just for Thanksgiving? Why are mince pies just for Xmas? WHY? I just picked up my daughter from her 3 day field trip to "Ironbridge" (literally what it sounds like) in Shropshire. She came home with a sore throat, and I think that pumpkin pie might be just the thing. Also, she's mad at me because we ate all of homemade oatmeal bread so I need to do some sucking-up. We take our baked goods very seriously! Thanks! 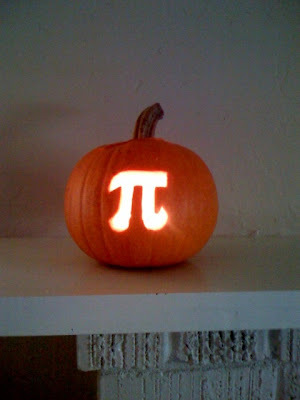 The pi cutout is the result of half an hour's careful work with my 6" serrated knife and my little paring knife. I decided to geek out last Halloween, and that was the result. I love pumpkin pie, too (after, oddly enough, being very turned off by it for most of my childhood). It really is a shame that it's only eaten around Thanksgiving--especially since canned pumpkin's available all year! Homemade oatmeal bread sounds lovely. I need to start making bread again--I just love the smell of bread baking. That Anne is skilled with a paring knife I say!! I'm right there on the pumpkin pie, although sweet potato is quite lovely also.